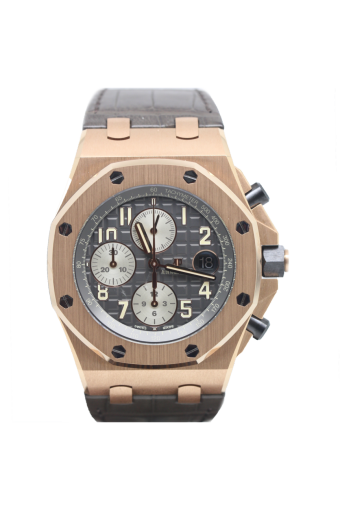 This stunning pre owned Audemars Piguet Royal Oak features both chronograph and date functions.The classic mega tapisserie dial is chocolate brown with silver accents and subdials. A 42mm watch case in 18ct Rose Gold with a display case back and a matching brown alligator strap,the pin buckle is 18ct rose gold. Cheshire Watch Company are supplying this watch complete with all boxes and Paperwork which is dated 2018 and it is still unworn and factory sealed.